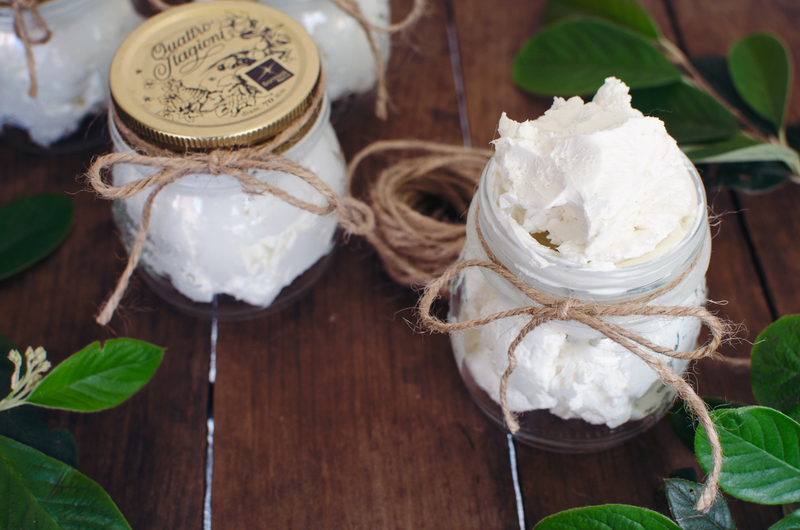 Body butter isn’t a fancy enough name for this stuff – even homemade whipped body butter doesn’t do this stuff justice. 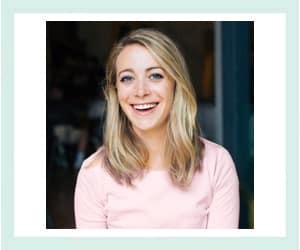 I should have probably called it something else that is more descriptive, like bikini time body butter or time-to-get-your-legs-out-it’s-summer body butter. Or legs-for-days body butter. Or I’m-going-out-tonight-and-man-do-I-look-good body butter. What I mean is this miraculous potion is body butter in the literal sense, unlike that store bought stuff that has all sorts of additives in it to make it more like a thick lotion. It’s solid in your hand but once you rub it on your skin it melts and gets oily – just like butter. That means it’s not the best all over body moisturizer for most people. If you’re going to put it all over, you need to cover yourself with something you don’t mind getting oily – or just plan on hanging out in the house naked for a while until it soaks in (or if you’re in San Francisco, plan a trip to Baker Beach or the Folsom Street Fair I suppose). Get the DIY and read more after the jump! What I mean is it’s best used strategically. For example, now that it’s getting warm out, it’s nice to put just a little on your legs when you wear a skirt. Or all the skin that’s showing in that hot little mini-dress when you’re going out and want to look extra nice. Boom, instant definition. It’s like airbrushing for your body. That’s what I should call it – super-secret-airbrushing body butter. Ok, so the name is a work in progress. Take my word for it, this stuff is magical and super flattering. It makes me feel like I could win a body-building contest. Plus, it’s all natural and has only ingredients that I can pronounce. Win. Bring ~2 inches of water to boil in a medium pan. Combine shea butter and coconut oil in a heat proof bowl. If you aren’t using a scale, you may want to microwave your jar of coconut oil in the microwave for 30 seconds or so to make it liquid enough to measure. Place bowl over bowling water and heat until melted completely, stirring occasionally. Remove from heat and let cool 30 minutes. Stir in almond oil and essential oils (start with about 15 drops and go from there). Place mixture in the freezer (about 20 minutes) to chill until oils are partially solidified – the rim of solid oils will extend about on inch from the sides and the whole mixture will look cloudy. Remove bowl from freezer and whip on high speed until it achieves a thick, buttery consistency. If it doesn’t whip, place it back in the freezer and let it solidify a bit more. Spoon into clean jars and enjoy – a little bit at a time! If your body butter isn’t “whipping” try putting it in the freezer a bit longer. For essential oils, I started with about 15 drops per batch and then added a few at a time until it smells about right. Don’t be afraid to rub a little on your hand and give it the sniff test before you put it in the freezer. 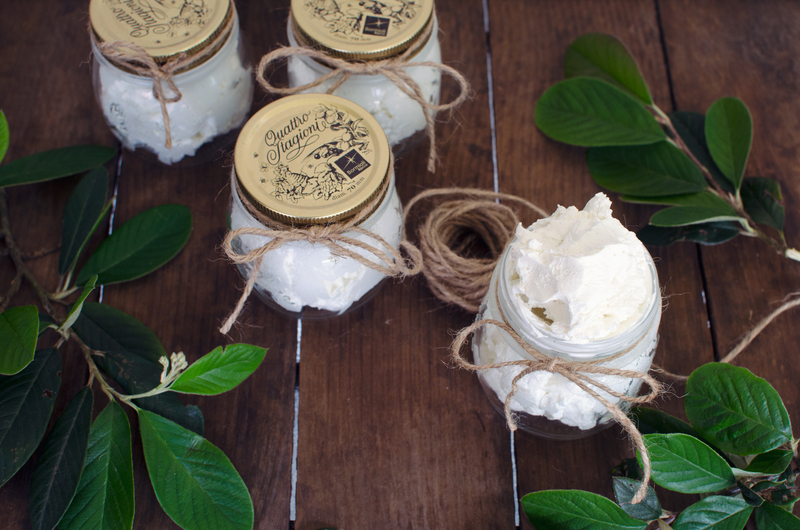 The body butter will keep at room temp almost indefinitely, but don’t put in a hot place or in direct sunlight. It’s important to keep the liquid to solid ratio equal, but you can substitute different oils (ex: olive for almond). I hope you enjoy your damn-gurl-you-been-working-out homemade whipped body butter. Ok, I’m done now. Love this! I made something similar a few years ago and I STILL have it!! Rich says I smell like a tropical princess with the lavender and coconut oil! Hahaha – I love the idea of lavender! I used lemongrass which is nice and fresh. Good to know it lasts because I made four jars which is basically a lifetime supply. I made this using Shea butter olive oil and apricot kernel oil. It is amazing! So simple as I went exactly by your directions. I used grapefruit essential oil for my fragrance. Love it. My sister did not put any scent in hers and it smelled nutty like the Shea butter. We will be making more of this to share with family and friends. Thank you! Wow thank you so much for sharing this! I love the variations you did and I’m so glad it was a hit! How much grams of almond oil?